'Theropod', literally translated, means ‘beast feet,’ Tyrannosaurus rex certainly fits this description. STAN’s foot is about 3 feet long as mounted. The T. rex heel did not touch the ground and although spring and rebound cannot be accurately assessed, the raised heel indicates it would have used these behaviors for increased speed. 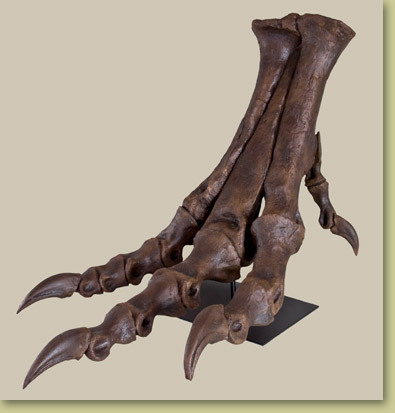 Our STAN T. rex mounted foot replica is a must for Children's Museums, Science Centers, and other places where you want to make a BIG impression. Fully extended, the foot would be approximately 48 inches long! Display it where your guests can place their foot next to it for comparison! The original STAN T. rex was discovered by Stan Sacrison, was collected by Black Hills Institute in 1992 and prepared by BHI in 1993-1995.